The Best Smoked Salmon ever! Brace yourself for the easiest, freshest, tender-est, and most flavorful smoked salmon fillet. And I’m not talking about lox, we’re talking fresh salmon, slowly smoked to perfection. We’ve got our secrets to great tender salmon, along with a video. 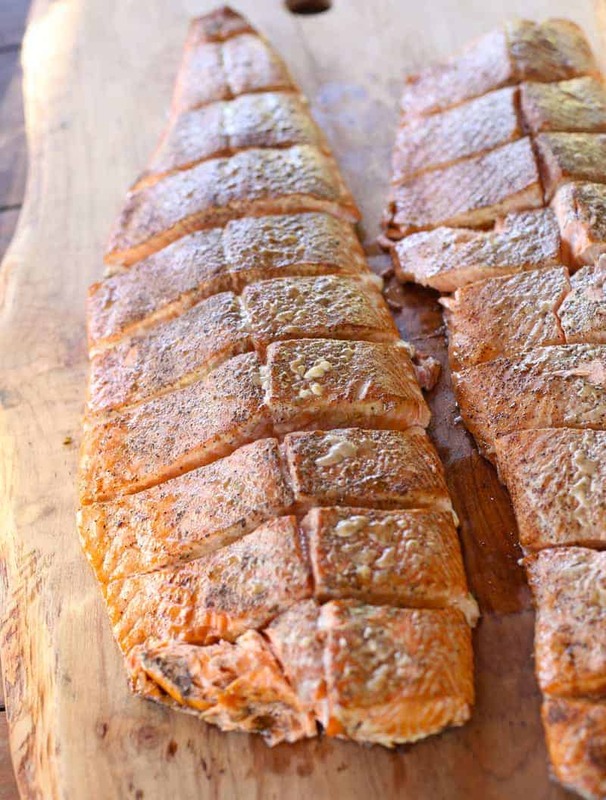 Salmon is one of my favorite things to cook on the smoker or grill. 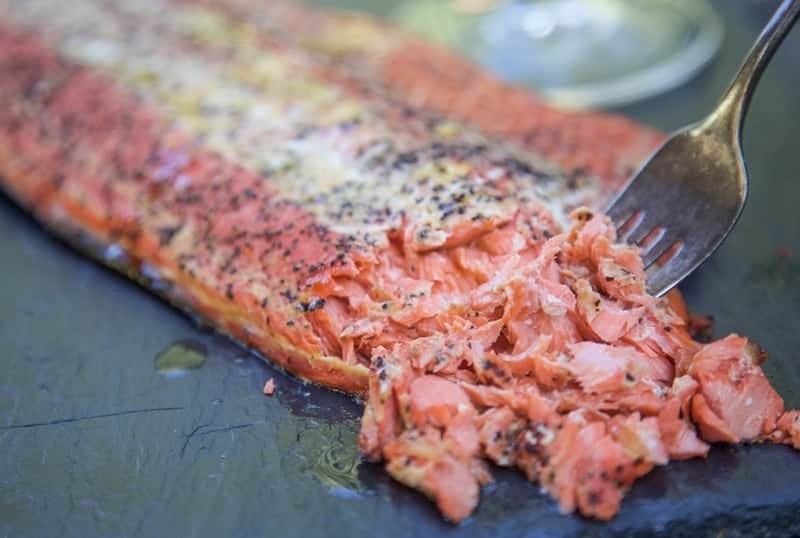 But too often salmon gets a bad rap for being too dry when cooked outdoors. Granted this can be so true! I’ve had my fair share of overcooked salmon. Eek! This, my friend, is not that! And there’s no secret dry rub or sauce to this salmon. Just some Dijon mustard, salt, and pepper. And you’ll experience the juiciest salmon you’ve ever had. With salmon there are several styles. Farm Raised – This is salmon raised in a farm, often you’ll find that the fat content is much higher and they will be bigger. It’s because they arguably don’t need to work as hard. So they slowly hang out in these large water pens. These are great for smoking as the fat content is very forgiving and makes for very tender and juicy salmon. Look for Columbia River King or Atlantic salmon most commonly. Wild/Line Caught – From the wild, this is your salmon that has been swimming in natural habitat. When you watch the videos of salmon swimming up stream…..you can see quickly why these are much leaner than their farmed cousins. These are great for grilling hot and fast, but can also be smoked. If you smoke a wild caught, just know it won’t have as much fat and will cook much faster. Look for Copper River, or Coho salmon in this style. Often these are seasonal. Either way it should be fresh. Smell it and check the eyes if buying a whole fish. It should not smell fishy, and the eyes should be relatively clear. An overly fishy smell or eyes that are glazed and frosted are indications of a not so fresh piece of fish. When buying you salmon fillet, ask the fish monger to take the pin bones out. These run along the upper portion of the fillet and off the spine. These can be removed using tweezers yourself, but trust me, ask them to do it for you. On the skin side, be sure to use a knife against the scales, scraping it (not cutting it) to de-scale it. A lot of times this too is already done. Rinse under cold water briefly and pat dry. Then you can season and smoke it. The key to tender juicy salmon is cooking it at a low heat and paying close attention to the internal temperature. Also consider using an entire fillet. 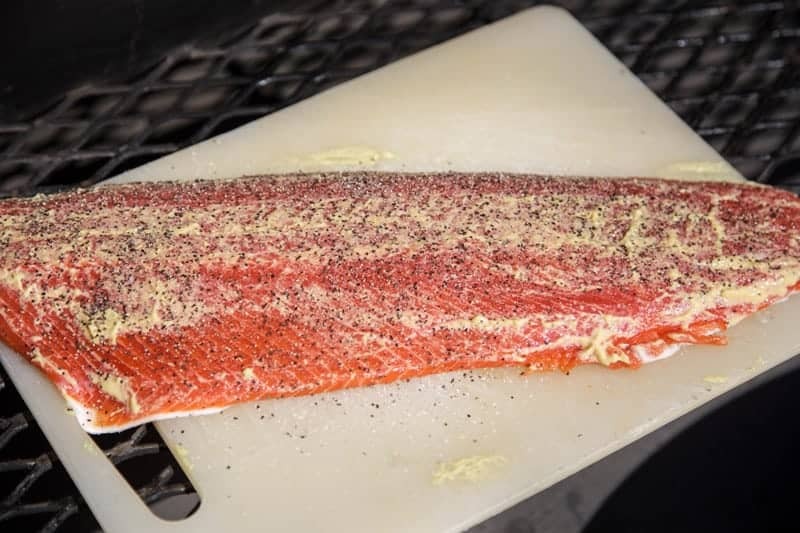 Good salmon will go quickly with a crowd and frankly having a multiple pound salmon fillet on your smoker is an awesome conversation piece. Even if you’re cooking for a small family, there are excellent uses for any leftovers (see the end of this post for a few ideas!). So we like to get the heat to 225 degrees (F) and then smoke for about an hour (***warning, the smaller the fillet or if using wild caught, start checking as early as 30 minutes***). You’ll see the salmon sweating out the fat, and you’ll see a nice red color start to form on the crust of the salmon. 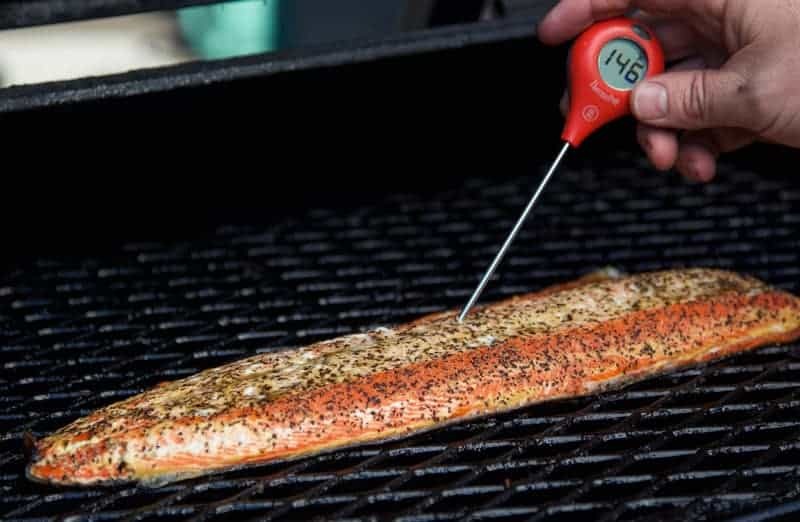 Check temperature at thickest part with a probe and you can also poke and pull apart the flaky salmon and make sure that the interior is pink and not translucent. Catering trick: Prior to smoking if you want to portion out the filet, run a sharp knife lengthwise along the salmon filet taking care to not cut through the skin. Then make small cuts horizontally. Then season and cook. When it is done, you can have your servings pulled right off. Or at least our kids do (see video). Speaking of kids, our boys love love love salmon, which makes me so happy as I know they are getting a healthy and delicious dinner for their quickly growing bodies! 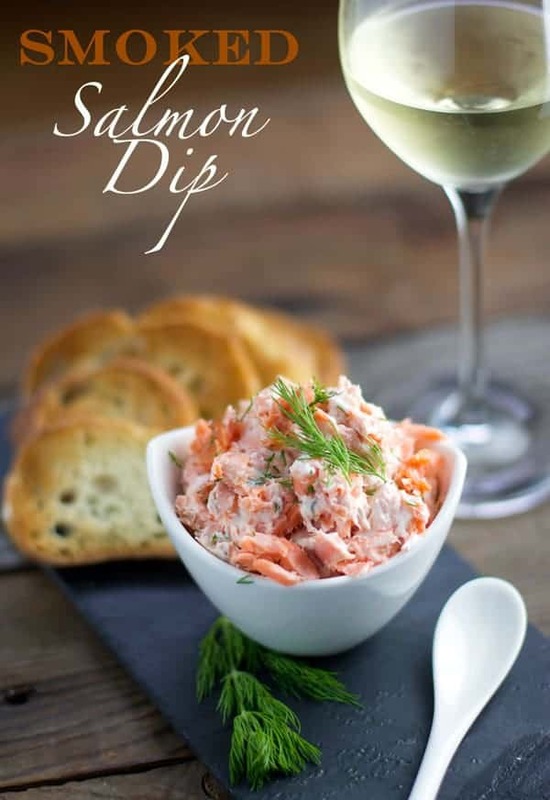 Recipe and video for fresh smoked salmon fillet. Secrets to juicy and tender salmon. Comes with wine pairing recommendations. Preheat smoker to 225 degrees using fruit wood (like cherry or apple). Prep and clean salmon, and pat dry. Season flesh side of salmon with the Dijon mustard, salt and pepper. Place on smoker and cook until the internal temperature of the salmon reaches 145 degrees (F). If you don’t have a thermometer you can pull back the flesh and make sure the inner portion is pink and not translucent. Remove from smoker and let sit for 5 minutes. Slice up and serve. 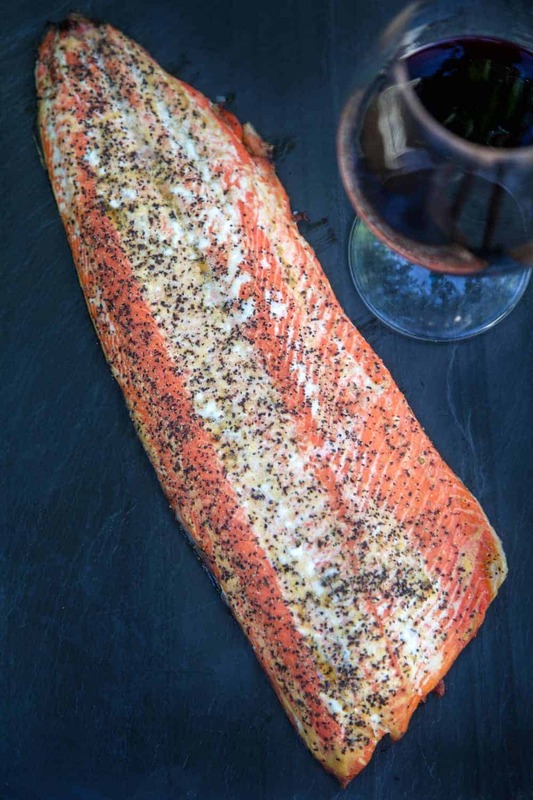 Hands down Pinot Noir is the most popular pairing for Salmon. Pinot Noir, especially from Oregon, has a lovely silky texture, with bright red fruit characteristics (cherry, strawberry and raspberry), often displaying earthy and spiced notes, with mild tannins. These characteristics are a fantastic match for the uniquely sweet flavors of Salmon and its silky textures. Pinot is not an over the top wine, nor is salmon an over the top protein (so long it’s prepared simply). Plus they also say what grows together goes together. 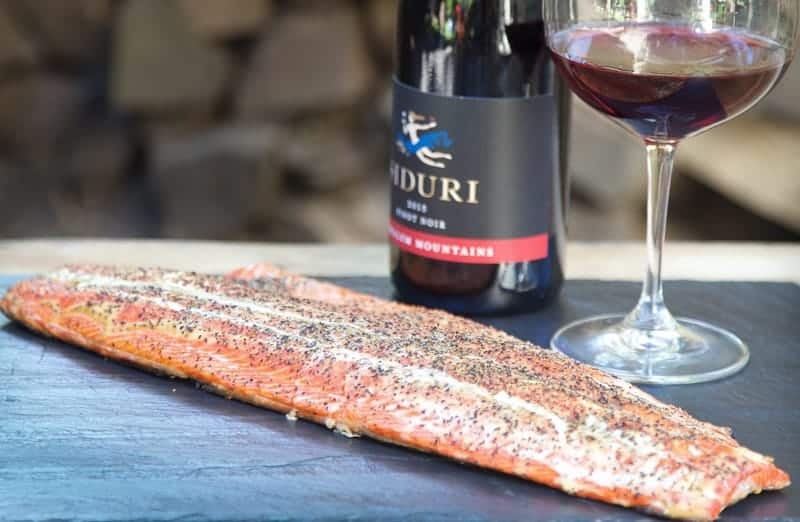 Pacific NW Salmon + Oregon Pinot Noir. You betcha! 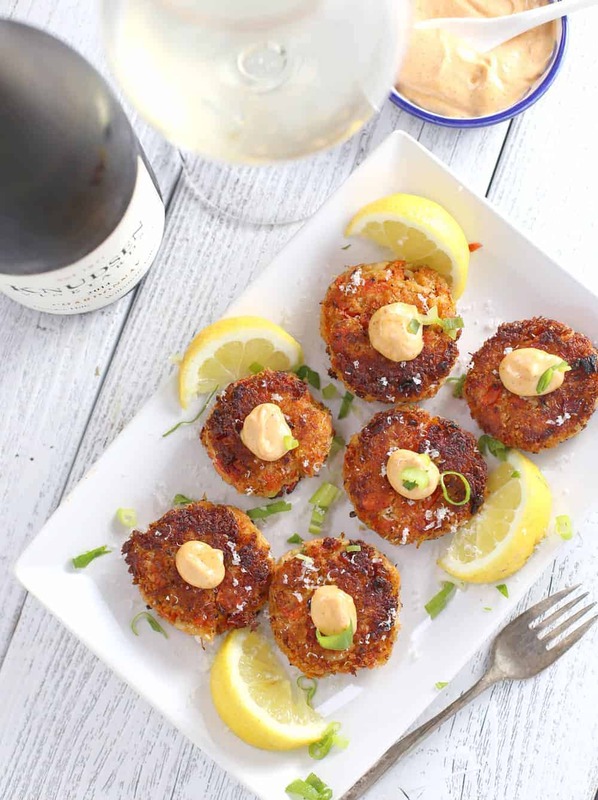 Of course, there are dozens and dozens of wines that pair well with salmon but Pinot is a classic for a reason. This Pinot is made with Oregon fruit, but produced in Santa Rosa, CA, by Siduri. *This wine was a media sample for review. See my sample policy here. 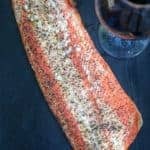 Please give cedar plank some love,would enjoy your take on this and wine pairings,after all pac. nor. west.Love your family! Thank you and we love cedar plank and use a lot of it!!! Also great for veggies!! Clark, no. We don’t find any residual smoke or fish flavor lingering. 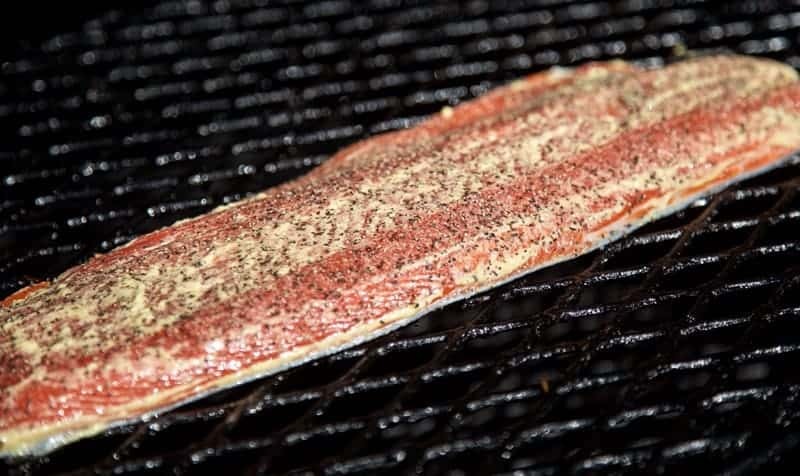 First we try to buy the freshest fish possible, and second, the heat on a grill or smoker get so hot that it burns off residue over each cook.